Karrell Fox was one of the top magicians in the country. the ultimate entertainer. He was also a comedian, master of ceremonies, mentalist, hypnotist, children’s TV star, author, producer, lecturer and mentor to an untold number of magicians. Plus, he did a mean W.C. Fields impression. In a 1961 interview, magician Monk Watson recalled his first meeting with Karrell Fox. “(It) was in the show room of Abbott’s in Colon. I did not work there, but was just standing around when in walked a mother and father and a young nice looking boy. The mother said, ”We’d like to see something to fit this boy”… “Yah, I’ll get on the counter and get a counter fit” came from the boy.” The ten year old Fox then spent a couple of hours going thru the magic catalog purchasing magic trick after magic trick. Thus began Fox’s career as a professional magician. Before long Fox was entertaining at birthday parties, churches, banquets and store openings. 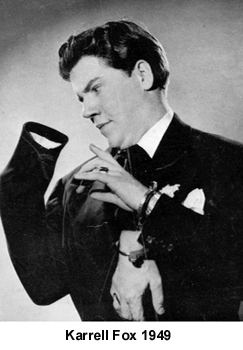 The young magician billed himself as “Karrell Fox- the King of Korn.” His style of magic was composed of equal parts of magic, personality and humor, with a distinct emphasis on the humor. 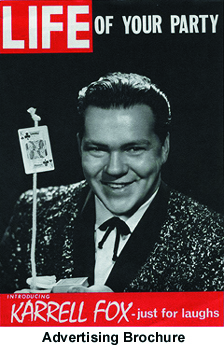 By the age of 18 Fox had worked at two magic shops, appeared on the cover of Tops magic magazine and became manager of the Detroit branch of Abbott’s Magic Co. During World War II he performed on many USO shows at service centers and camps in Detroit. Fox was a pioneer in magic for industrial and corporate clients. In 1944 he was one of the first magicians to perform at a trade show. Fox realized that performing at local clubs, lodges and private parties was fun but limited; the real money could be made in the corporate world. In 1947 Fox wrote, directed and performed in a variety show for the J.L. Hudson Co. He also began an association with the Detroit Auto Show, which lasted for 20 years. WWJ, Detroit’s first TV station, signed on in 1947, and it wasn’t long before Fox was basking in its phosphorescent glow. 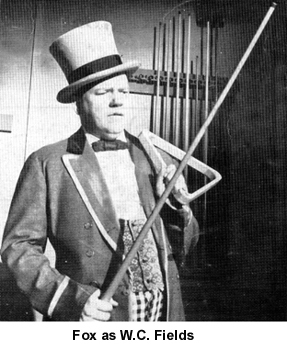 He was the resident magician on Junior Jamboree, Detroit’s first children’s TV program. In 1949 he starred in his own weekly program, also for WWJ, Famo and his Magic Carpet. In 1950 Fox was approached by the Luckoff, Wayburn & Frankel advertising agency to host a new children’s television show for their client, Twin Pines Dairies. During the planning stages of the show Fox received his draft notice. When the agency asked Fox if he knew of another magician to take his place, Fox recommended his good friend Clare Cummings. Milky’s Movie Party debuted in September of 1950 with Cummings as Milky the Clown while Pvt. Karrell Fox was in special services at Fort Leonard Wood in Missouri for the next two years. After his discharge from the army, Fox returned to Detroit. The ad agency promised Fox that he could reclaim his role of Milky when he returned from military service, but he couldn’t bring himself to take the job from his good friend. In the early 1960s, Fox managed to get an interview with William Clay Ford to discuss the possibilities of a magic presentation to promote the latest models of Ford automobiles. During the interview Fox offered to show Ford a card trick. A card was picked at random from the deck, and Fox attempted to find the selected card. When he failed to produce the correct card, Fox instructed Ford to look out of his office window, where Fox had hired a sky writer to write “ten of clubs” in the sky, which was the correct card. This was the beginning of “The Magic World of Ford,” a three million dollar road show with six units that travelled the country for four years and began a twenty-two year association with the Ford Motor Company. In 1964 Clare Cummings decided to retire as Milky the Clown to devote more time to his day job as automobile paint salesman for DuPont. 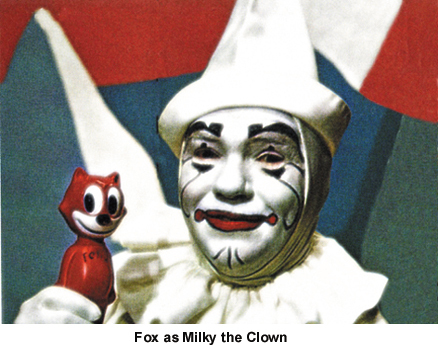 Fox seamlessly took over the role of the magic clown until the show’s demise in 1967. An easy way to know which version of Milky you remember watching; Fox took over the role just as the show went over to color. And of course Cummings was easy to identify with his famous gap-toothed smile. Fox had another career as one of the country’s foremost W.C. Fields impersonators. He appeared as “The Great Man” in over sixty commercials for Faygo, Stroh’s Beer and Frito-Lay, as well as seven industrial films for General Motors. He also portrayed Fields in a one-man show. In the early 1970s Fox wrote and produced a magic show for Michigan Bell Telephone, which was performed by Fox and others around the state for three years. Fox was known by his fellow magicians as magic’s best-known “general practitioner.” He could entertain in every situation, from children’s parties to the most sophisticated audience. His repertoire included hypnotism, mentalism and motivational speaking. He used eight different brochures to promote eight very different acts, each directed at a specific audience. Over the years Fox authored over a dozen books on magic and created dozens of magic tricks. He was co-owner of the Fox Fun ‘N Magic Shop, which was located in downtown Detroit at the Fox Theater Building (a happy accident) and later on the east side of Detroit. He appeared at more magicians’ conventions than any other magician, a record that still stands to this day.